· Both the smartphones will retail from Moto Hub stores , Large Format Retail chains, and top mobile stores across the country. For online consumers, they will also be available on Flipkart. Motorola today introduced two new smartphones that cater to your specific needs with better cameras, faster charging, improved processing speed and maximized displays. - new moto g7 includes features that matter most to you at a remarkable price point of INR 16,999, the motorola one gives you the Android experience you love at just INR 13,999. Since moto g redefined the Indian smartphone market in 2014, more and more consumers are interested in premium phones at affordable prices. Generation after generation, we remain focused on our main consumer commitment: offering phones that have the premium features you deserve, without sacrificing the quality, affordability and dependability you expect. Because no two consumers are alike, we understand their smartphone needs are also very different. Therefore, we are introducing smartphones that cater to your specific needs with better cameras, faster charging, improved processing speed and maximized displays. - new moto g7 includes features that matter most to you at a remarkable price point of INR 16,999, the motorola one gives you the Android experience you love at just INR 13,999. Capturing, creating, and sharing creative content has never been easier, thanks to the new moto g7. Bring images and videos to life on an ultrawide 6.2" (15.7cm) Max Vision Full HD+ display with a u-design. The 12MP dual camera system is equipped with Portrait mode, Spot Color, Cinemagraph, Auto Smile Capture and Google LensTM so you can unleash your creativity and interact with the world around you. 50% faster than the previous generation, the moto g7 can tackle your most intensive creative tasks thanks to a super responsive Snapdragon™ 632 Mobile Platform.3 Its 15W TurboPowerTM charger gives you 9 hours of power in just 15 minutes and all-day battery helps you power through the day.2 And with an upgraded, contoured Gorilla Glass design, it looks as great as it performs. With our second Android One smartphone for the indian consumers, we give you the Android experience you love, three years of security updates and let you do more with a smart camera thanks to Google Lens. We’re giving you the latest software and AI-powered innovations from Google, right out of the box. That’s just the beginning, because with your favorite moto experiences included, this smartphone is ready for you. Capture life’s unexpected moments with motorola one’s advanced 13MP dual smart camera system and 8MP selfie camera. Always have that breathtaking sunset to look back on or highlight last night’s festivities to elevate your Instagram with a photo using our portrait, cinemagraph, and time-lapse modes And with AI- powered Google Lens, you can interact with the world around you just by pointing your camera. Take a photo of a dog walking down the street and Google will find what breed it is. Longer battery life means no need to worry about losing your GPS directions when you’re out and about. When your battery is low, charge up quickly with our 15W TurboPowerTM charger for up to 6 hours of power in 20 minutes. The phone’s Qualcomm® Snapdragon™ 625 2.0 GHz octa-core processor keeps your device performing at peak speeds, so it responds instantly to every tap, touch and swipe.A modern, curved glass body frames motorola one’s 5.9” (15 cm) 19:9 Max Vision display. It’s the perfect size to channel your inner director and record your 4K videos, fit more on the page to read your favorite book, or take notes and multitask more easily with a split screen. And do all of this while using one hand. - Get cashback of Rs. 2200 from Jio. Applicable on Rs. 198 and Rs. 299 plans. T&C apply. MOTOROLA, Stylized M Logo, MOTO and the MOTO family of marks are trademarks of Motorola Trademark Holdings, LLC. Google, Android One, Google Lens, Google Photos, Google Assistant and Google Duo are trademarks of Google LLC. All other trademarks are the property of their respective owners. ©2018 Motorola Mobility LLC. All rights reserved. 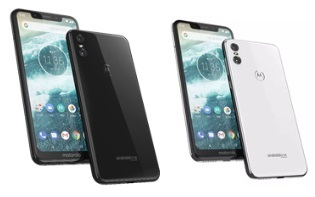 motorola one power is designed and manufactured by Motorola Mobility, a wholly owned subsidiary of Lenovo.